We have been on the market since 1998. More than 800 sites in russia, cis, and eastern europe. Logus uses microsoft .net technology and is based on a three-tier architecture, which makes it easily scalable horizontally and vertically for the optimal utilization of server hardware and for the best performance. We have solutions for management companies, hotels, health resorts, hostels, vacation retreats, etc. Training and assistance in designing business processes according to global standards, lh school for hospitality professionals. Development of interfaces with third-party applications and software of any degree of complexity, including the russian hotel and restaurant automation system for the hospitality industry. Logus the box for small business. PIR EXPO 2018 - Thanks to All participants! That ended the exhibition PIR EXPO 2018! Thanks to everyone who came to our stand! Dear friends, we are happy to share the news with you. 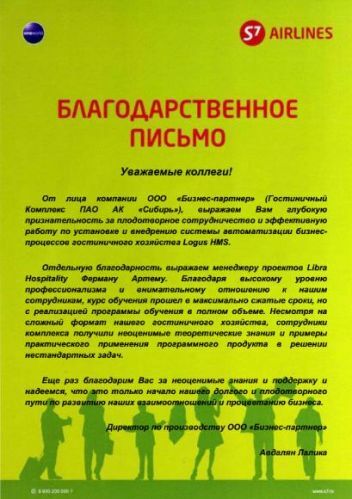 Libra Hospitality is nominated to the National Import Substitution Award. The winners will be announced on September 11 at the official ceremony. We hope we win the Award! Stay tuned! Automated management of hotels and health resorts is a vital element of the IT infrastructure of a hospitality industry project. The configuration of the IT system determines the performance and interaction of all the key functions. Alpha chose Logus HMS. "The implementation project was very ambitious and included multiple useful interfaces, such as Central web booking module for agents LOGUS CRS, access control, a minibar mobile app, and many more. New version of Logus HMS 2.1. New functions. Integration with BookingSuite and Bitrix. Features offered by Hobout. Libra Hospitality does not stand still and continues to actively develop and improve its products. A new version 2.1 of Logus HMS has recently been launched. In it, we met some of our customers’ most pressing requests. Libra Hospitality is continuously developing and improving the hotel management system Logus HMS. 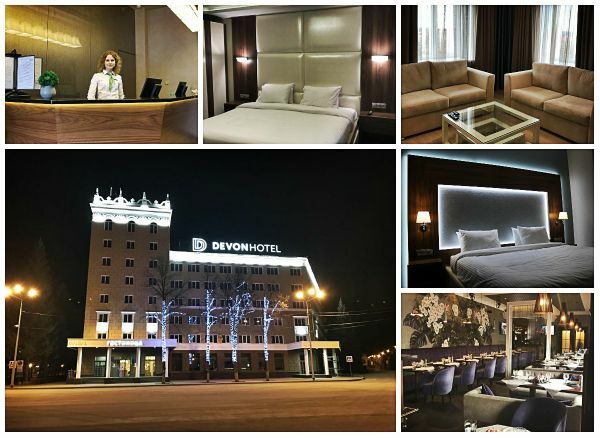 Elena Borneman, implementation project manager at Hotel Devon, lecturer at the Department of Tourism, Hospitality and Catering, Ufa State Petroleum Technical University, shared her impressions of Logus HMS system at Hotel Devon Hotel in Oktyabrsky, Bashkortostan, Russia: "Migrating to Logus HMS was straightforward enough for our staff thanks to Artem Ferman, project manager and representative of Libra Hospitality. Staff training and software installation were completed in the shortest possible time and all the knowledge necessary to use the solution was acquired. At the opening of Hotel Devon, the representative provided live, which helped us enormously! When problems arise, we always contact the support team — they always come up with a prompt solution to the problems and we accumulate experience for the future. It should be noted that thanks to the Logus HMS training program for administrators, it is very easy to become familiar with the data. Thank you for the cooperation and we wish you success and new achievements". Hotel Universitetskaya is located in a clean and green area in the immediate vicinity of the Moscow State University on the Sparrow Hills and the Bolshoi Moscow Circus at Prospekt Vernadskogo in Moscow. From the top floors of the hotel, one can see the golden domes of the Cathedral of Christ the Savior and the Kremlin, the Poklonnaya Hill, and the Moscow City. The hotel has 257 rooms of different categories. It offers accommodation in modern, comfortable rooms and a broad range of extra services, as well as a restaurant, business services, free parking, taxi, transfers, 24/7 luggage storage, safe for rent, baby cots, events, guided tours, souvenirs and travel items, hairdresser, car rental, Wi-Fi, etc. Hotel Universitetskaya has been using Logus HMS from February 2016. "Getting used to the new software was not easy, but we were inspired by the prospect of fully moving to the reliable and functional Logus HMS software. We learned the basics pretty fast. Those wishing to become an advanced user and understand all the subtleties of the software had to work hard. The process of immersion and thoughtful study continues. After all, the solution is constantly evolving too! When the software was adopted, we began to trust the digital data and drastically reduced the paperwork. Now we no longer use the ‘chessboard,’ instead we assign rooms the day before the guest’s arrival (using the room availability sheet), which helps to avoid fragmentation. I would like to note the effort by the developer’s support team, who solve all issues related to the functioning of Logus HMS (for example, creation of new rate options, modifications to packages, coding of new channels). We are pleased that the Libra Hospitality team responds to our requests and we contribute to the accelerated improvement of the software. What we love most in Logus HMS is the transparency of the hotel’s operations (up-to-date information is available at any time and is easy to understand), cutting-edge design, obvious development potential." Loft Hotel Nabokov is a contemporary loft hotel in downtown Rostov-on-Don. It offers atmospheric open space for creativity, recreation, and communication. Visit the multiple fashionable outlets, withdraw cash at the bank office, work or relax in the co-working area, or do a workout. The hostel has a bar, complimentary coffee and tea, a large lounge, a convenient kitchen, and much more. Free Wi-Fi is available throughout the hostel. You can play golf or go for a walk in the area. Loft Hotel Nabokov has been using Logus The Box since July 2015. The hotel has 19 rooms and 57 beds. Guests can choose between booking an entire room or a bed. "At Loft Hotel Nabokov, the staff training program was a condensed one, as the staff were more prepared. Thanks to the limited functionality and the highly user-friendly interface of Logus The Box, designed specifically for small hotels, the staff were instantly comfortable with the new system. In my opinion, the training duration was more than sufficient for the receptionists to master the software at the expected level. I can say that the staff find the system more convenient than the solutions we used before. One way or another, additional inputs arise in the process and it is much easier to handle them and respond. Every hotel software is unique and multifaceted. It takes several months of use to understand what functions, reports, and printed forms you need. At the moment, Logus The Box has practically all the reports and forms we need and these are promptly upgraded by Libra Hospitality’s support team." Crystal Deluxe Hotel is located in the very center of Lermontovo, a few dozen meters from the sand and pebble beach. The modern hotel building captures attention by the elegant tower’s facade with panoramic windows offering a view of the sea horizon. Crystal Deluxe Hotel has been using Logus HMS since June 2015. The hotel has 94 rooms of various categories. Guests can choose between booking an entire room or a bed. "Every employee processes the incoming information in her own way. But with Logus HMS, multiple complicated manipulations are a thing of the past. During the training course, the receptionists mastered the possibilities offered by the software suite. If the staff had any questions during check-in — and they had lots of questions — Libra Hospitality representatives explained and showed what had to be done. The hotel has noticeably improved the check-in efficiency — many of those who stayed here before noted the speed and convenience of the check-in. Guests come with their own vision of a hotel stay. They order the services they need. In turn, we try to be flexible when responding to their requests. Logus HMS greatly speeds up the process. The room availability sheet helps see the overall picture, and room assignment gives an opportunity to meet the guest’s preferences by offering on the spot the desired accommodation option." Aurora Park Hotel is located near the city of Vladivostok, in the vicinity of Sanatornaya station, 500 meters from the Amursky Bay. The park surrounding the property is the ideal place to take the family out for a walk. The hotel’s comfortable rooms offer breathtaking views of the landscape. Aurora Park Hotel has been using Logus HMS since April 2015. The hotel has 88 rooms of various categories. At the hotel, the guests can have a meal at the Italian restaurant Limoncello, hold an event at the reception building, spend time with the family at the children's playground. Free Wi-Fi and free parking are available. The transition to Logus HMS was very straightforward, thanks to the experience the staff had with Opera. The user-friendly interface and gentle learning curve of Logus HMS are also worth mentioning. Training of Aurora Park Hotel employees took about a week, during which they acquired all the skills necessary to do their job. As a room management method, we chose room assignment before check-in, because assigning a room when the booking is made does not allow us to track the room status (clean, needs cleaning, etc.). We have not heard any negative feedback from our guests. If the staff have suggestions or experience problems in their work, we send an email to the support at Libra Hospitality and hey respond very quickly to every single request." On behalf of Business Partner LLC (Sibir Airline Hotel), we express our deep gratitude for the fruitful cooperation and efficient installation and implementation of the hotel automation system Logus HMS. We express special gratitude to Artem Ferman, project manager at Libra Hospitality. Thanks to the high professionalism and attentive attitude to the needs of our employees, the training was very condensed, but the entire training program was completed. Despite the challenging format of our hotel property, the staff acquired invaluable theoretical knowledge and were presented case studies showing the software product’s applications when solving non-standard problems. Once again we thank you for the invaluable knowledge and support and we hope that this has merely been the very beginning of our productive cooperation and partnership. 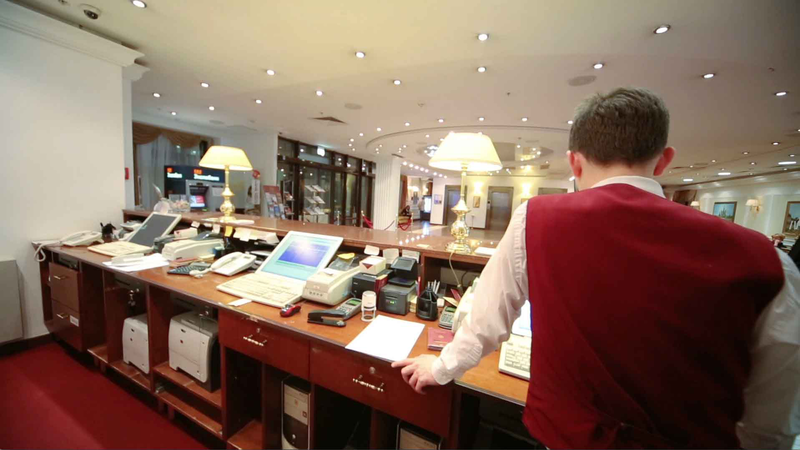 For more than 20 years, Libra Hospitality has been a leading provider of automation solutions for the hospitality industry in Russia and CIS countries. Our team has extensive experience in implementing advanced IT solutions at all types of hotel properties — large and small, independent and chain. For the efficient management of health resorts, holiday hotels, and hostels, we have developed custom modules that take into account all their ins and outs. For automation of small hotels, we offer the unique solution Logus The Box. For more information, visit the Products section. Our technical support is there to help you 24/7. In 2015, we launched a new project — Libra Hospitality School (LH School). LH School arranges webinars, seminars, and round tables on the most pressing issues facing the hospitality industry. Discussions are led by industry professionals. Check out past events on the LH Sсhool pages. Thank you for your interest in our company. We look forward to meeting you and having an opportunity to present the strengths of our software. Investing into a software solution is not simply purchasing a piece of software — it is the first step towards establishing a long-term and mutually beneficial partnership with an IT company.